On May 11, 2018, Farmland and Forest Fund of the Republic of Slovenia was celebrating 25 years of operating. 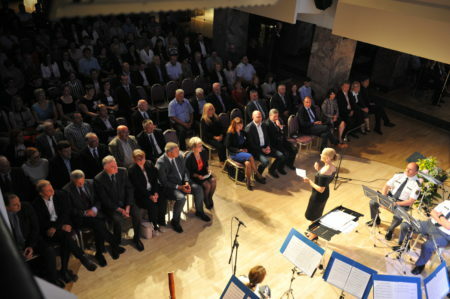 The celebration was in Festival Hall in Ljubljana. On this event, Slovenian Minister of Agriculture, Forestry and Food, Mr. Dejan Židan and director of Farmland and Forest Fund of the Republic of Slovenia Irena Šinko had speech to the guests. Farmland and Forest Fund of the Republic of Slovenia was establish with purpose to manage and dispose with agriculture land, farms, forests and other land owned by Republic of Slovenia. Other tasks of Fund are also care for sustainable management with agricultural land and farms. The Fund is also obligated to return the agricultural land and forests to beneficiaries in denationalization procedures. The Fund returned to beneficiaries in denationalization procedures 163.000 ha of land, worth 399.500.000 €, 94.000 ha of forests, 54.000 ha of agricultural land and 14.000 other type of land. – to enable and encourage development of young family farms and helps farms which get into financial troubles, by buying their land and still allow them to use this land.